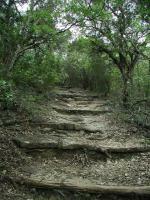 Getting there: The entrance to Wild Basin is right off of Loop 360, so getting there is easy. From the north, head south on Capital of Texas Highway, passed the Lake Austin bridge. Just before you get to Westlake there should be a sign indicating the turn lane on the left to get into in order to get to Wild Basin. If you reach Bee Caves Road, you've gone too far. From the south, look for the parking lot entrance on the right perhaps a mile after Bee Caves Road. 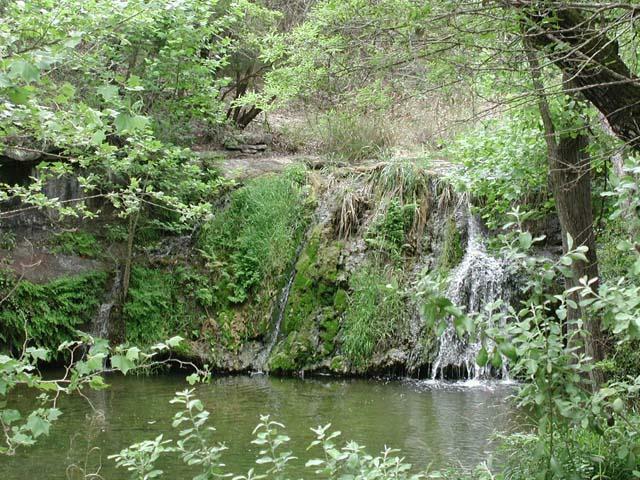 The Hike: Wild Basin consists on approximately 2.5 miles of well maintained hiking trails that includes a very informative interpretive guide giving insight into the native plants and animals that live in the region. 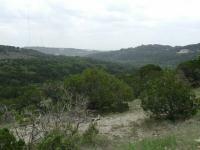 You have the option of going for a serious hike or taking a more leisurely stroll while you learn more about Hill Country wildlife. Guide brochures are available at the trailhead. On our hike this day we combined many of the trails in Wild Basin and stopped at most of the interpretive trail markers. So our hike time may be longer and route more haphazard than a straight hike. This route should give you a pretty good idea about all of the terrain and views that Wild Basin has to offer. We started off the hike at the waypoint "Trailhead". This is next to the large Wild Basin map display and just short of the education center that we will encounter later in the trip. There's a collection box here for Wild Basin entrance fees. They work on the honor system here. Be honorable. 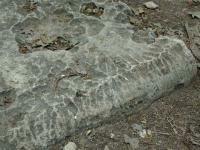 Rillenkarren and other natural phenomenon are described in the interpretive guide. Don't know what it is? Go find out! Most of the beginning of the trail is downhill. In this first section the descent is not too steep. To your left you'll get some good views of a creek valley and the next ridge to the north of Wild Basin. Some of what you see there is part of the Black Capped Vireo Nature Preserve. Further downstream you can see houses along the ridge. The area is popular and open spaces are filling up with houses. The waypoint marked "Overlook" provides some of the best views that you'll see in Wild Basin. 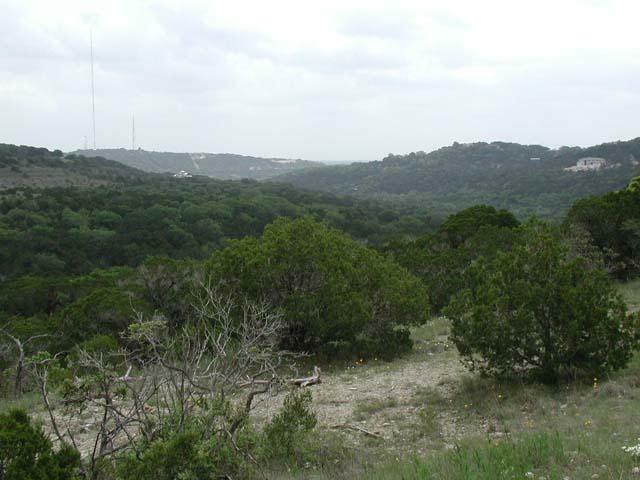 From this vantage point you can see the creek valley that feeds into Bee Creek. Enjoy the vistas for the moment and read about some the birds that you may see soaring over the valley. There are plaques filling you in on some of the common birds in the area. There is a trail that hugs the slope near the "Overlook" waypoint. If you want a very short hike that would be a good place to continue and make a circle heading back up to the start. We continued on what Wild Basin calls the Triknee Trail. Not too far after "Overlook" the vegetation gets a bit thicker and the trail descends down toward Bee Creek. The steepness is not too severe, but steep enough in parts to warrant slow going to make sure that your footing is secure. The topo map shows Wild Basin Road as going through Wild Basin and continuing through the other side of Loop 360. However, this is not the case. 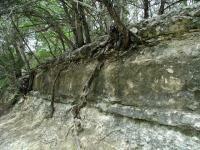 That may have been a plan in place before Wild Basin was set aside as a nature preserve. At "Side Trail" there is a short trail that the Wild Basin map indicates leads to a small pond. We didn't take that side trip this time around and continued down what Wild Basin calls the "Creek Trail"
The Creek Trail follows along the flood plain of Bee Creek. You'll have to cross the creek twice, the first of which occurs at the waypoint "Creek Cross". 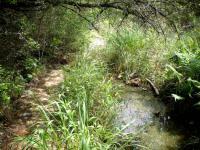 None of the crossings are difficult as the trails are very well maintained. The ample rocks provide more than enough clearance above the water, so your feet won't get wet. The Madrone Trail continues up the other side of the Bee Creek Valley. We'll catch that trail on the way back. For now, we continued to follow Bee Creek upstream. 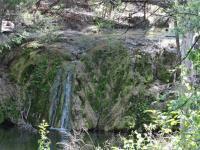 Bee Creek includes a very pretty waterfall at the waypoint with the same name. 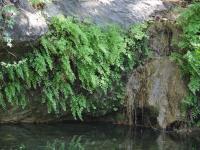 Right off of the Creek Trail there is a spot on a boulder outcrop that overlooks the waterfall and the pool of water at its base. There's even a small bench to sit and rest upon while enjoying the view. The Madrones Trail meets the Creek Trail just above the waterfall. At first, the trail heads up the southern slope of the Bee Creek watershed. 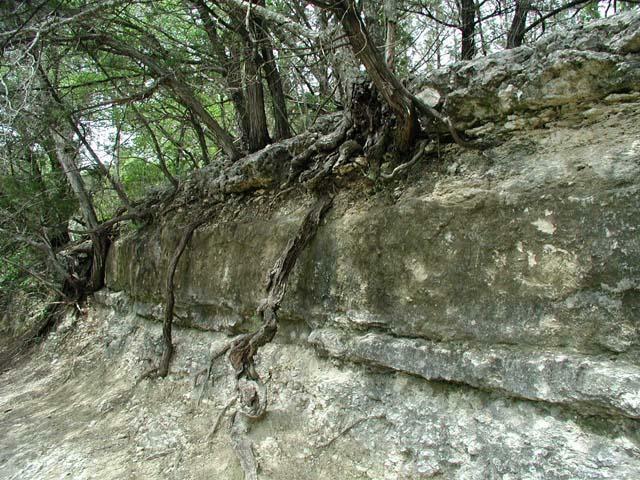 Occasionally passing a smaller stream or creek bed like that found at the waypoint marked "Dry Creek". Unlike the other trails that we visited on this trip there are no interpretive stops along the trail. The number of hikers along this section of Wild Basin is much less, so if you're looking for more solitude this is the place to go. When the trail almost gets to the edge of the preserve boundary near the top of the ridge it heads east and hugs along the 800 foot contour line of the ridge. 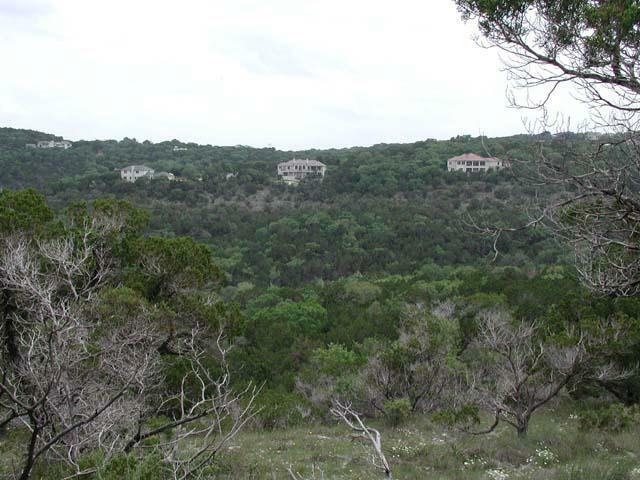 Houses have now been built right near the edge of the preserve. The vegtation sometimes prevents more vistas but the trail at the top of the ridge here presents some opportunity to look back on the other side of the valley and see the earlier hike trails. The Madrones Trail heads back towards the creek, not far from the first creek crossing that we passed earlier. Part of the trail down is over an interesting stair stepped rock. 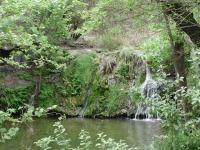 When the trail rejoins the Creek Trail we head west again, back towards the waterfall. When we get back to the waterfall we start the trek up hill, headed in the direction of the starting point. Wild Basin calls this the Falls Trail and it will intersect with the Ledge Trail which we'll save for another day and the Easy Access Trail loop, which is situated closer to the education center. We walked down the Easy Access Loop portion of the trail which we missed earlier to look at the additional 5 or so interpretive guide stops. Then once the loop met up with the Triknee trail near the waypoint "Overlook" we turned back and continued uphill on the path we had not yet taken up to the education center which we have marked with the waypoint "HQ". In all, it took us about 3 hours to cover the 2 miles of this hike. Some of it was taken up reading the interpretive guide, which we recommend at least once on your visits to Wild Basin. OK. If you don't know, rillenkarren is the wavy, ridgy surface of the rock formed by water dripping over them over very long periods of time. There's a lot more to learn about on your next trip to Wild Basin. Beautiful trail; multiple paths; some steep inclines & declines; lots of shady trail; pretty but small waterfall; nice flowing creek to cross over a few times. Just remember that since you're going downhill on your departure, you must hike uphill on your return. "Madrones" trail is now "Yaupon". There is a "Ledge" trail not on the map (connects two main trails below Laurel) and "Woodland" which may be a new trail that goes up the middle. Part of "Creek" Trail has now been moved. You have to follow up Woodland, and then a ways up, take a right, go by a new "overlook" and then back down to where the original trail crosses the creek. They are apparently trying to restore that part of the (now waterless) creek. I'm still upset with them for not putting "exit" signs down there as my GF was lost down there for hours. Yeah they have maps near the bldg but if you dont take one, youre pretty much screwed as youre lucky to ever see anyone out there (though that does make it a bit more appealling). 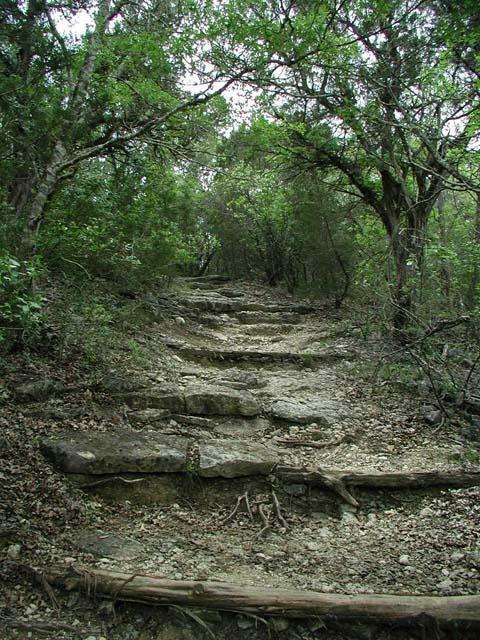 This is very much a down, down, down hike til you get to the creek then its a way up and a way down on Yaupon. coming back of course is UP UP UP so be ready! Nice park though. HCO group, doing the outer loop. Pretty-well maintained and not crowded. Ran across two other groups - both at the waterfalls. The road noise is noticeable often, but not bothersome (just kinda takes away from the solitude). You have to re-do some areas if you want to successfully hike every section of all of the trail. We were rolling, so we managed to hit every segment. Nice short hike - I took the kids (5 and 2) and they had no problems. The noise from 360 was a little distracting at points, but overall we only saw three other folks out - on a Saturday. We also saw deer and some prairie race-runners.